Chalet Plan Fert is a recently built 4 bedroom Chalet, on the Chavannes Road, with easy access to the village and slopes. You can ski back to within 200 meters of the chalet and the bus stop is right outside. The Chalet can accommodate up to 10 in comfort. The Chalet has a large patio from which there are wonderful views over the valley and of Mont Chery, it also benefits from getting the sun in the evenings. The living area has high ceilings, and is open plan in design. The dining area has a table which can be extended (shown not extended in the photograph), there is a wood burning stove and the comfortable seating area overlooks the patio, there is a TV and DVD Player. The open plan kitchen is just off the living area. The kitchen is fully fitted, well equipped and has a Nespresso machine. The Chalet has a massive Garage, which is ideal for storing bikes in the Summer and Ski equipment in the Winter. The Chalet has a large laundry room with washing machine and dryer. 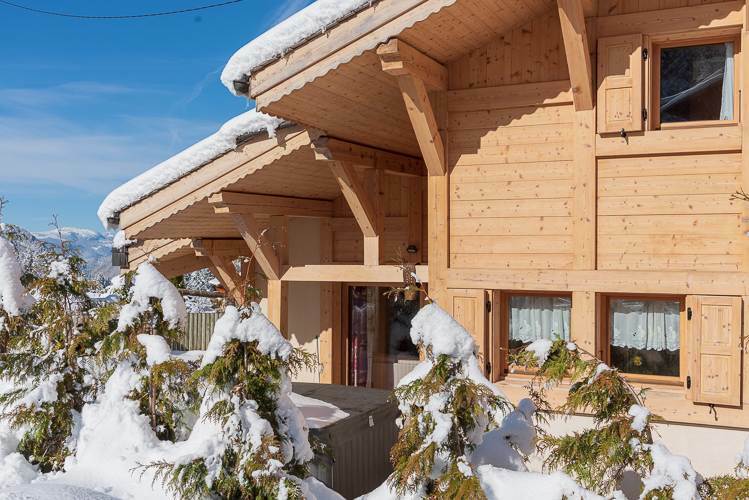 The Chalet benefits from a large double garage, which can also be used for storing skis and boots. Outside there is also parking for two/three cars. • Bedroom 1 – King size bed with en-suite shower, WC and wash basin. • Bedroom 4 – Two single beds with en-suite bathroom. On the first floor there is a separate shower room with WC and wash basin (this is in addition to the en-suites to bedrooms 1&4 ). On the ground floor there is a WC. Where is Chalet Plan Fert?